Janssen proudly features artwork created by people affected by the illnesses and diseases we are dedicated to treating and preventing. Please visit our art gallery to learn more about the artists and view more artwork. 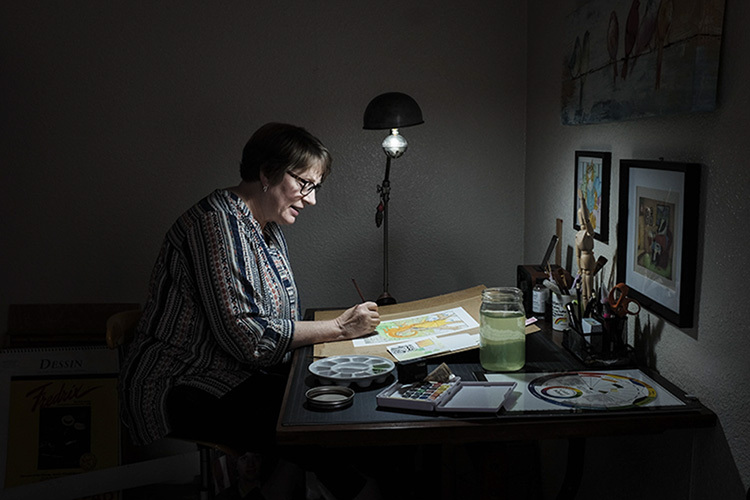 Some people like to color outside the lines, but Leslie "Wren" Vandever has always preferred to create her own lines for her whimsical drawings and paintings. "I started my first artwork when I was about two years old, and I was given crayons and paper," Wren says. "My parents saw immediately that I could do things with crayons and paper that they just weren't expecting. I would open up the back of the coloring book to the white card cover and start drawing my own things there." Her creative approach continued throughout her youth. "I would copy cartoons out of the comics on Sundays and start learning how to make the different characters myself," she says. "In elementary school and in junior high, I really liked doing art more than I did anything in school. I didn't really have any formal training until I got into high school, and then I started taking art classes every year. When I went to college, I went in with art as my major." "Her grandpa used to stop by every day after work, and he would put a pencil in her hand," recalls her mother, Doris Shirley. "He started her out drawing pigs. And she was very good at drawing pigs when she was about two, two-and-a-half. And she just kept on drawing. She was just happy as she could be just drawing and reading." Wren's favorite media now are watercolor, pen and ink, pencil, colored pencils and a digital stylus. "I like the way watercolor paint is transparent and sinks into hot press paper, and I like using ink with it," the Sacramento, California, resident says. "I also like it because it's so fast, and once it's done, it's done. 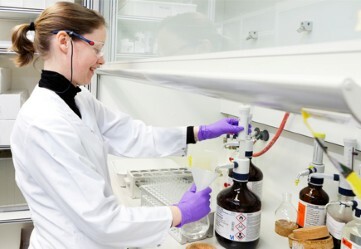 But, if you've done it wrong, you're going to have to do it all over again." 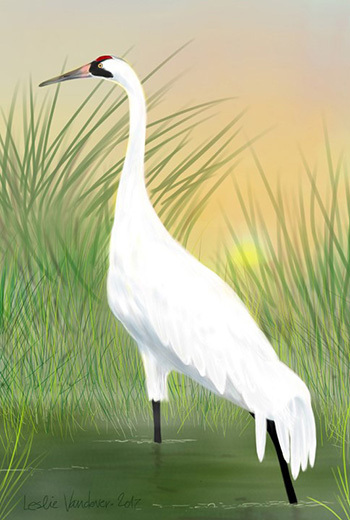 Her Whooping Crane recently joined the Janssen library of licensed artwork created by people affected by the diseases we work to treat and prevent. "My whooping crane came about originally because of a Twitter challenge where the letter W (for whooping crane) was the subject," Wren says. "I went ahead, and I did that. But, I also have always loved those birds. It gave me some real inspiration to do that particular piece of work." 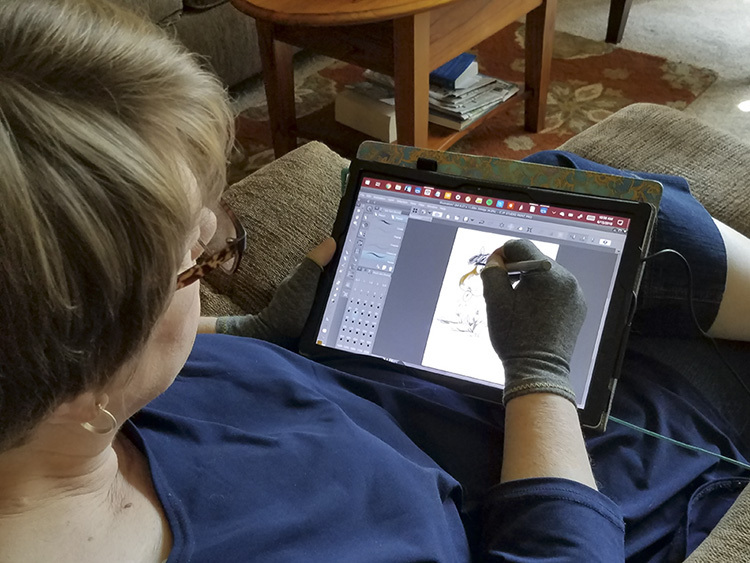 Wren has struggled with rheumatoid arthritis (RA) for more than 30 years, which often makes pursuing her passion a painful experience. 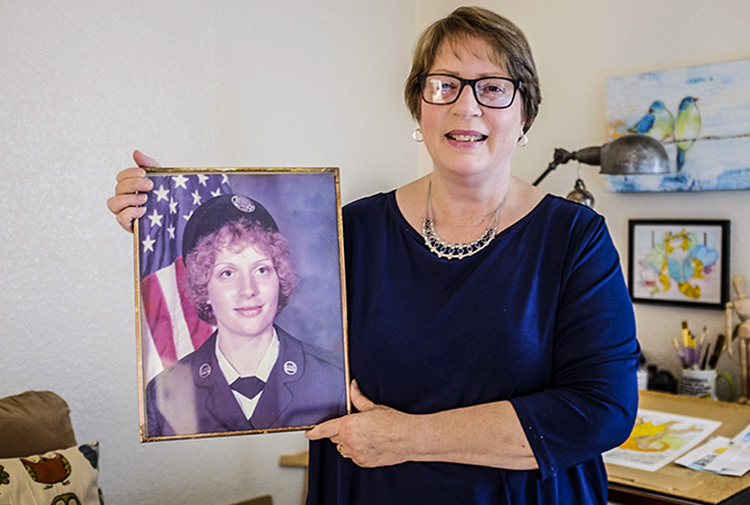 Wren, with her Air Force portrait. 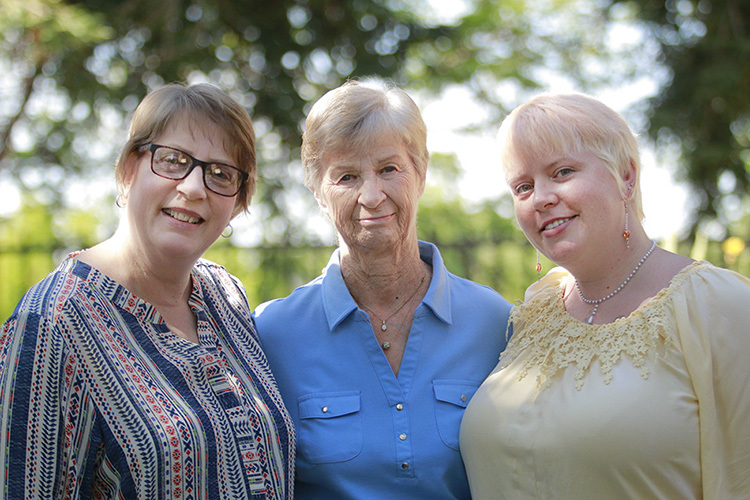 “I was just 31 years old when I was diagnosed with RA,” Wren says. “I was really surprised because I thought that was something just old people got." Just as she had with her coloring books years ago, Wren refused to be limited by arbitrary restrictions, and certainly not RA. She kept working, and she kept drawing and painting, and she eventually became an activist for those living with RA. Wren's active social media presence led to an invitation to attend Janssen's first Joint Decisions conference. She now attends three to four RA conferences each year. "I want to give others with RA hope and energy and confidence." Through it all, art has remained Wren's favorite activity, and she continues to draw every single day. “My RA influences my art in that I use it to distract myself from the pain that the RA causes,” Wren says. “While I'm doing the art, I'm not focusing on the pain. When it's hard for me to hold a pen or a stylus, it gives me motivation to keep trying." Wren in her home studio. Drawing with her stylus pen. Being her mom Doris’ primary caregiver also helps take her mind off of the pain she may have in her hands. “My biggest vision is to be able to let [people with RA] know that they can live their lives with hope and with as much energy as they possibly can,” Wren says. "Creating art has always been all about joy." Wren's daughter, Cary Nicole "Nikki" Vandever, is not only one of her biggest fans, but she's also following in her mom's artistic footsteps. Left to right: Wren Vandever, Doris Shirley, Nikki Vandever. "It's fantastic that my mom has been able to use artwork to overcome arthritis as opposed to just living with it," Nikki says. "She's an activist. She gets to travel and talk to so many different people. And, she's not just giving them information; she's giving them her own experience, her own life. She can empathize and be a support for them." *The opinions expressed by Leslie “Wren” Vandever on her blog / social media are her own independent views as a journalist and are not endorsed by Janssen.